This image of Earth from space was acquired from the GOES-14 satellite on September 24, 2012 at 1745z, the first image from GOES-14 while acting as GOES East, the replacement of GOES-13. A major weather satellite monitoring the U.S. East Coast has shut down, prompting officials to activate a spare satellite to take its place. 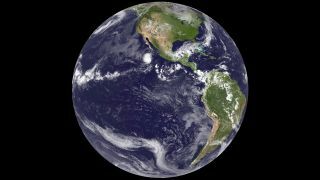 The GOES-13 satellite failed after days of erratic behavior, officials with the National Oceanic and Atmospheric Administration officials said Monday (Sept. 24). The replacement, GOES-14, has already begun snapping pictures of Earth from space to monitor the U.S. eastern coast along with the continental U.S. and Atlantic basin, they added. "GOES-14 will remain the primary GOES satellite over the Atlantic basin and Continental U.S. until the imager and sounder data issues on GOES-13 can be fully diagnosed and hopefully fixed," NOAA officials said in the Monday statement. Artist's conception of the GOES-13 satellite in Earth orbit. The GOES-13 satellite, which is also known as GOES East, launched into space in 2006 and was responsible for tracking weather systems across the eastern United States while another GOES satellite monitored the country's western regions, according to NASA records. GOES-14 launched in 2009 and was placed in a storage orbit to serve as an in-space spare. "NOAA maintains backup GOES satellites in case unforeseen events occur, providing full redundancy for monitoring severe weather over the U.S. and its territories," NOAA officials said. GOES-14 will serve as GOES East until the GOES-13 satellite's malfunction can be repaired. GOES stands for Geostationary Operational Environmental Satellite. The satellites orbit the Earth in geostationary orbits, which allow them to continuously look down on the same part of Earth from a distance of 22,300 miles (35,888 kilometers). The first GOES satellite launched in 1974. GOES-13 and its later counterparts are part of a newer generation of GOES weather satellites. In addition to tracking weather systems, the satellites are also used to relay distress signals from emergency beacons and can monitor solar activity during sun storms, NASA officials have said.